Premises liability lawyers help those who've been injured due to the negligence of property owners. Properties can include theme parks, restaurants, and more. Millions of Americans enter restaurants, grocery stores, department stores, theme parks, hospitals and all other types of establishments each day. On any given day, a person entering one of these establishments is injured by slipping on a wet or dirty floor, tripping over objects in places where they shouldn’t be, by poorly maintained equipment or by having improperly stacked merchandise fall on them. Mansfield Melancon’s premises liability lawyers have experience representing individuals injured due to a property owner’s negligence. 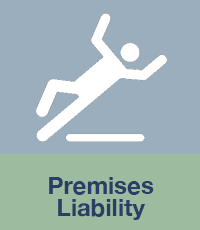 Slip and fall accidents are not the only type of premises liability claim. Property owners owe all invitees a duty of care that extends beyond a simple cleaning and maintenance of the floors. Whenever you enter a premises, it should be kept in a reasonably safe condition. That includes the security of the premises against theft and assaults, the sturdy construction and sound condition of the premises, and the maintenance of fire alarms and sprinklers. Any place that is open to the public has a responsibility to maintain that establishment in a safe and clean condition. When an establishment fails to do so, they can be held responsible for injuries that occur as a result of their negligence. The injuries that victims of unsafe premises face can be substantial, and you deserve to be compensated for your injuries. Slip and falls top the list for most common premises liability cases, however, premises liability law extends beyond these scenarios. Other examples of when a business might be liable include injuries due to fires, dog bites, swimming pool incidents or toxic substances. More often than not, a businesses will later deny that anything ever happened, or that they were at fault for anything, so it’s up to you to prepare yourself in case you need to make a claim. Many people recover completely from a slip or fall, however, some victims suffer serious injuries, especially to their shoulders, knees and backs, which sometimes they never fully recover from, even after painful and expensive surgery. Those victims can end up losing their jobs because they can’t physically do it anymore, and medical bills begin to pile up because they can’t pay them. Mansfield Melancon’s premises liability lawyers can assist you in recovering the compensation you deserve. If you are in need of reliable legal advice on how to proceed after a premises liability accident, contact Mansfield Melancon immediately to make sure your rights and interests are being protected. It is important to receive compensation for your premises liability accident. It is equally important to have a team of skilled lawyers who will provide the personalized attention your case requires and deserves. You can reach us at our New Orleans number at 504-500-1108, Baton Rouge number at 225-612-0800, Lafayette number at 337-409-0003, or you can contact us online. You can also send us an email with questions about your claim at info@mansfieldmelancon.com.